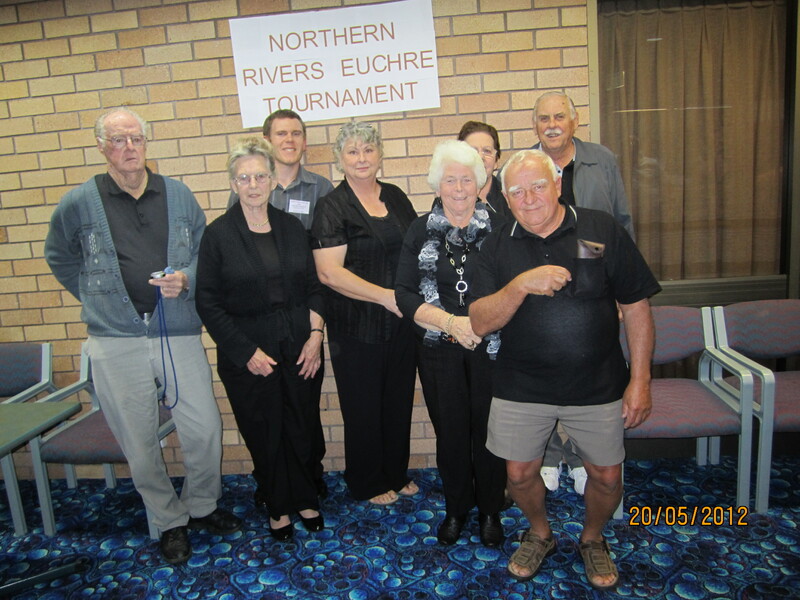 The Northern Rivers Euchre Club was formed in November 2011 under the name of the Lismore Workers Euchre Club with 7 committee members voted in as representatives. A date for the clubs 1st euchre tournament was decided for the 19th 20th May 2012 and the following month a decision was made to hold the event at the Lismore Workers Club, Keen St Lismore. On the 3 Feb 2012 the Club drafted and approved a constitution and elected 3 office bearers to manage the clubs affairs and an 8th committee member was voted in (a 4th office bearer was elected the following month). During the lead up to our tournament the committee organized two barbecue fund raisers to assist with expenses and to add to our prize money. On the 19th & 20th of May 2012 the Lismore Workers Euchre Club celebrated its inaugural tournament with players traveling from as far north as Bribe Island Qld and as far south as Sydney NSW, all competing for a weekend prize pool of $3,015.00. A total of 15 games of euchre was played on our half day tournament Saturday and saw prize money of $450 dollars for 1st Prize, while 2nd Prize was a collective of 3 people, all on the same points, sharing 2nd and 3rd prize of $405 dollars. Then all emphasis was directed on Sunday with a total of 27 games of euchre played throughout the day. 1st Prize was a staggering $1000 taken out by a lady in South Port QLD who had won 20 games. The First Perfect Hand was not won on Saturday so it jackpotted to $100 dollars on Sunday and was won by a gentleman from South Port Qld. So as you can read the Queenslanders took out the major prize money for our inaugural tournament. Much positive feedback was received during the weekend which indicated our tournament was an overall success thanks to the players, committee, sponsors and our helpers who we couldn’t have done without. Thanks for the kind words John. Like your euchre tournaments in Qld, we strive to make ours as enjoyable for players as possible and welcome any feedback that may improve our event in the future.